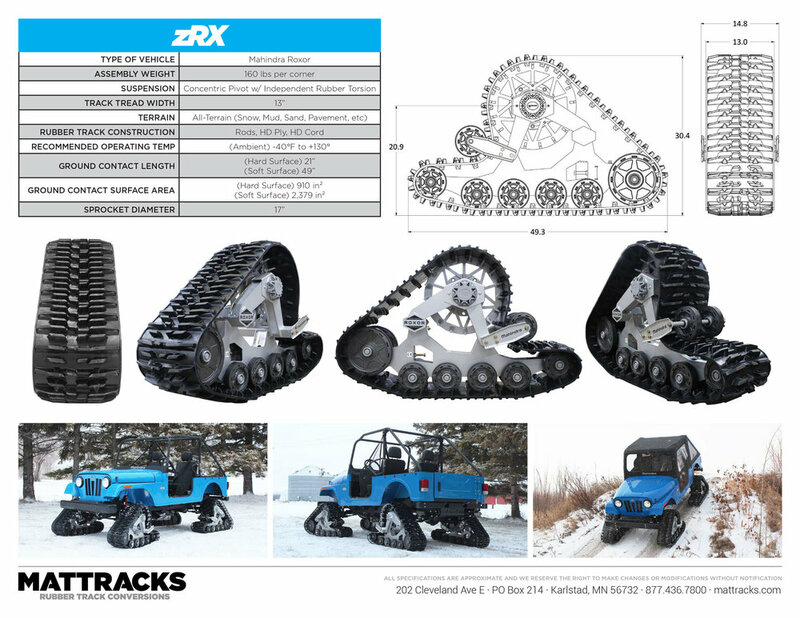 Introducing the exclusive Mattracks zRX track system specifically designed for the Roxor. With its patented rubber torsion anti torque system and full rubber torsion suspension, the zRX track system delivers a smooth ride and terrain conformance resulting in maximum traction. Designed with weight savings in mind, without sacrificing durability, zRX features a HSLA steel frame and aluminum drive sprockets. In addition, Mattracks’ patented Z style track provides optimum vehicle clearance while keeping the track system centered on the axles. The result is unsurpassed sprocket engagement which limits track slip and delivers maximum tractive effort. With Mattracks proprietary tread design, the zRX is a true all terrain track system. Not just for snow and mud, the zRX can be driven down pavement to get to your favorite trail or worksite. The Roxor with the zRX track system improves traction, ground clearance, reduces compaction, and provides improved flotation on soft terrain. Practically maintenance free, there’s nothing to grease, comes with triple sealed heavy-duty road wheels and a heavy-duty automotive spindle bearing. Built to be ROXOR tough and installed at your local ROXOR authorized dealer, the Mattracks zRX Rubber Track Conversion System is proudly engineered, designed and built in the USA.